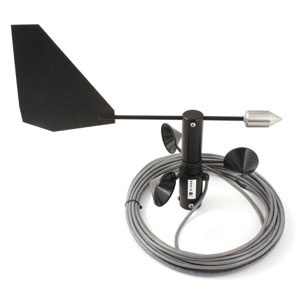 The 200-WS-23 Current Loop Wind Sensor monitors wind speed and direction. Each parameter is converted into 4-20mA output signals for use by process control or monitoring systems. No external power is required since the encoding electronics for wind speed and for wind direction are isolated and powered from their respective 2-wire current loops. The 200-WS-23 Current Loop Wind Sensor monitors wind speed and direction. The electronics converts the raw signals from the wind sensors to proportional 4 to 20 mA current loop values for use by process control or monitoring systems. It acts like a variable resistance that draws 4-20 mA when powered with 8 to 30 Vdc. No external power is required because the encoding electronics for wind speed and for wind direction are isolated and powered from their respective 2-wire current loops. Two versions are offered. The 200-WS-23 measures both wind speed and direction, while the 200-WS-23S measures wind speed only. Both systems consist of two subassemblies, a wind sensor and a signal conditioning electronics package in a NEMA housing. Although it has only one PC board, it contains two completely independent circuits, one for wind speed and one for wind direction. 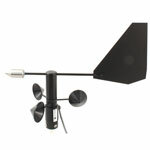 The wind sensor includes a three cup anemometer and wind vane. The sensor is ruggedly constructed of UV resistant ABS plastic and anodized aluminum parts, and includes 40' of cable. Additional cable lengths can be supplied. 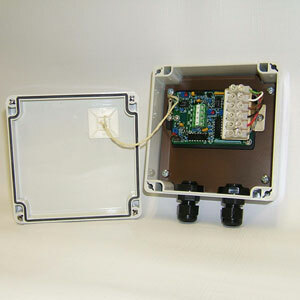 The electronics package is supplied in a gasketed wall mount NEMA enclosure.